This adorable baby grouping actually is the result of photo-manipulation accomplished after the model photography shoot. The baby in blue is silhouetted and imposed from a completely different photograph, as is the computer. 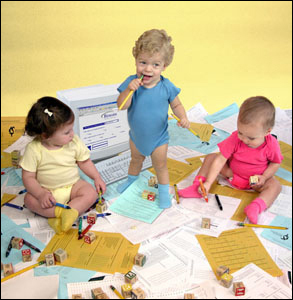 Additionally, the babies and papers were covered in crayon markings and needed extensive retouching. The original background was also removed and replaced with the bright yellow. This final image was used as a trade show graphic.